Producing a scientific calculator using a simple four-function calculator chip. In an article in the journal Wireless World, Nigel Searle of Sinclair Radionics Ltd outlined a general problem of calculator manufacturers: "When considering new products, a calculator manufacturer is constantly faced with the problem of whether to buy a standard chip from a semiconductor house, or to design a new chip. In the former case, he will be faced with the prospect of competing head on with other manufacturers using the same chip, whose calculators will therefore have the same functional characteristics as his own. In the latter case, he will have a unique product, but there are risks involved. Until recently, a custom calculator chip design has meant a substantial investment of both cash and man-power in a product which takes almost 12 months to come to a rapidly changing market... However, there is now an alternative, which involves re-programming a standard chip to radically alter the capabilities of the end product—the calculator. The resultant chip will be as easy to produce as the standard device from which it has been developed so there are no unknown quantities with respect to the validity of the overall design or production yields. Furthermore, the design effort and cost are considerably less; so also is the total development time, allowing the calculator manufacturer the luxury of having only to meet the market's requirements 6 months ahead instead of 12." Sinclair used this very radical approach to produce a small, low-cost, scientific calculator by reprogramming the Texas Instrument TMS0805 chip, that was basically designed for simple four-function calculators, to provide scientific functions. Distinctive features: Small, for its time, limited scientific, reverse-Polish notation (RPN) calculator. Scientific functionality produced by single chip. Displays only in scientific notation - 5 digit mantissa, 2 digit exponent, red LED (made by Bowmar). 4-function, limited scientific, reverse-Polish notation (RPN). Main integrated circuit: Texas Instruments TMC0805 (here date coded to 1974, week 18) "calculator-on-a-chip" programmed to provide scientific functions (see below). 6v (4 x AAA batteries). 50 x 111 x 19 mm (2.0 x 4.4 x 0.75 ins). Sinclair "Cambridge" series size, but not to be confused with the later Sinclair Cambridge Scientific. Introduced 1974, initial price was � [about US$80] + Value Added Tax (VAT), but the receipt for one example that was originally purchased two years later in July 1976 shows that it then cost just �[about US$14] including VAT. Was also available as a build-it-yourself kit, as shown below. 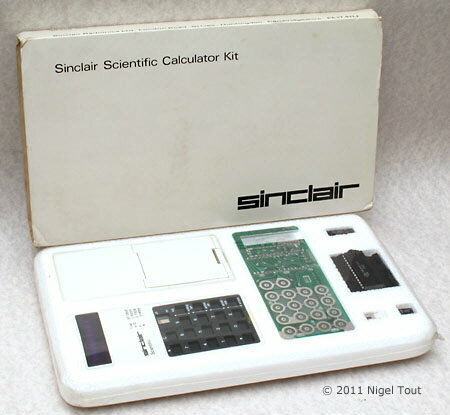 On a personal note, the Sinclair Scientific illustrated above was bought in mid-1974 and was my first electronic calculator, costing nearly a week's wages. It had a great battery-saving feature - Someone would come and ask if they could borrow the calculator. After tapping some keys, they would ask where the "=" key is ? On being told it used RPN and did not have such a key they would hand it back and go off to find "a normal one" to borrow. A Sinclair Scientific calculator kit, still shrink-wrapped in the polystyrene container. Texas Instruments had produced their first "Calculator-on-a chip", the TMS1802, in 1971 - See the page 'The Arrival of the "Calculator-on-a-Chip"'. This chip did not contain just the logic for a calculator but was actually a programmable "Microcontroller-on-a-Chip" since it contained a logic unit, RAM, and ROM. The ROM had a mask-programmed capability, to give limited variation in the functionality of the calculator. Texas Instruments saw the potential for using this sort of chip as a general purpose microcontroller and renumbered the TMS1802 as the TMS0102, the first example of the TMS01xx family of calculator/microcontroller chips. By 1974 Texas Instruments were offering the successor family, the TMS08xx series, including the TMS0805 which was the basis for the Sinclair Scientific. The first pocket-sized scientific calculator had been launched by Hewlett-Packard as the HP-35 in 1972. Having produced simple calculators, Sinclair decided that he wanted to produce a scientific calculator, but typically he wanted it to be smaller and cheaper. Although the Hewlett-Packard machine used several integrated circuits, Nigel Searle was involved in investigating the design of a single chip which would provide the required scientific functions. The work on designing a single chip for a scientific calculator for Sinclair proved it to be impractical, however, Searle visited Texas Instruments in Houston to see if they had an alternative that he could work on. His new idea was to take an existing calculator/microcontroller chip designed for a simple four-function calculator and re-program its ROM so that it would perform scientific calculations. As can be imagined, this was not a trivial task and Searle applied a great deal of ingenuity to shoehorn a scientific calculator into the TI chip. The resulting TMC0805, custom version of the standard TMS0805, was employed in a standard Cambridge series casing to produce the Sinclair Scientific calculator. 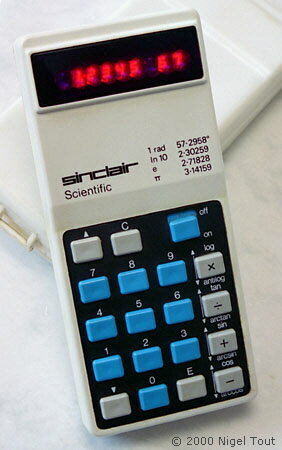 Though less capable and less accurate than the Hewlett-Packard HP-35, the Sinclair Scientific did, for a fraction of the price, provide scientific functions that were, anyway, more accurate than the slide-rules which were still commonly in use by the less affluent. 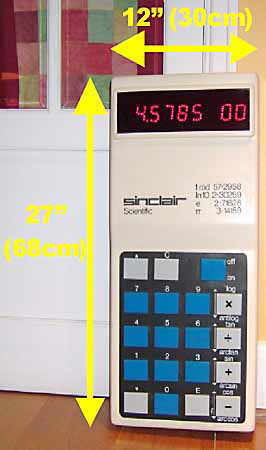 For more information about the programming of the TMC0805 to produce the scientific functions visit Ken Sherriffs website at http://files.righto.com/calculator/sinclair_scientific_simulator.html, where the Sinclair Scientific has been reverse-engineered to reveal all of the secrets of the scientific programming. There is also an amazing simulation of the calculator which runs through the program in the TMC0805 as you operate the keys on the keyboard. This amazing machine is a giant Sinclair Scientific calculator. It has the functionality of the hand-held model, but has the enormous size of 12" x 27" (30cms x 68cms). Powered by 240v AC, it has a display formed of an array of dozens of discrete LEDs. Grateful thanks go to Henry Padolsey for providing these incredible photographs. 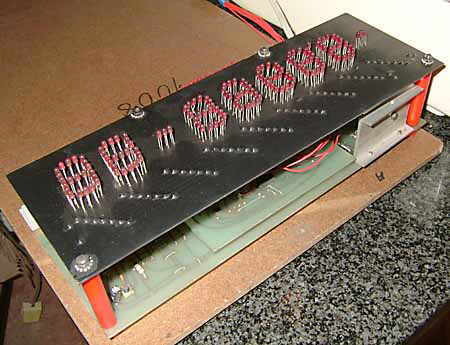 This photograph shows the array of discrete LEDs which make up the display, with the electronics boards below, all mounted on a substantial wooden back. Further information about Sinclair calculators and the Cambridge range can be found on the Vintage British Calculators site. Searle, Nigel H., 'Programming the "Scientific": A four-function calculator chip re-programmed', Wireless World, Vol 80, No 1462, June 1974, p203.